Heather Sieger, a College of the Atlantic student, looks out over the water while on her EcoLeague exchange. You never know what’ll push you to apply for a program like the EcoLeague. Sometimes, you’ll feel the tug of a friend’s influence; other times, a transformative experience points the way. For EcoLeague alumna Heather Sieger, who used her exchange to travel from her home school College of the Atlantic to Prescott College, it was both. 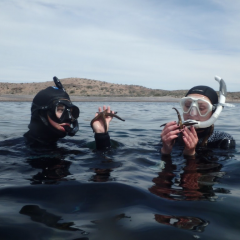 The Kino Bay Center for Cultural and Ecological Studies that Sieger studied through is a Prescott field station on the Gulf of California in Mexico. Besides the marine biology track which she chose, it also offers experiences in marine studies and conservation—“They’re all things that I would love to do,” she quipped. For Sieger, who’s held an interest in marine biology since participating in the semester program, Coastal Studies for Girls in high school, the center was a great fit. 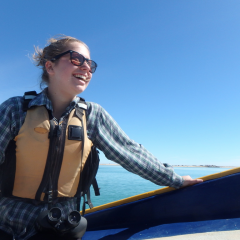 In all, Sieger spent just three weeks at Prescott, with the college’s academic block system allowing her the chance to focus her time at the Kino Bay research site. In between classes like “Diversity of Life” and “Oceanography,” she took on an independent field research project. “We had been finding this little crab all semester and we couldn’t identify it, and our professor couldn’t identify it either…It wasn’t in any of the field guides or anything, which is really crazy, and so that’s what I ended up doing my project on, was ‘What is this?’ and ‘What can we learn about it from watching it and collecting them and looking at them and when can you find them and what times of day are they active?’” Sieger and other students reached out to researchers, and she is now working on a paper about the basic field ecology of the species. Making aquatic discoveries in the waters of Kino Bay. Sieger wasn’t only making discoveries about this little-known crab, which takes the scientific name Leucosilia jurinei, but about the environment of Mexico and the southwest United States. The distinctive biomes represented at each of the EcoLeague member colleges gave her the opportunity to study tropical and coastal marine life over the course of her college career. To go from the tide pools of Maine to the deserts of Arizona was a great shift—“just polar opposites,” she called it. Sieger has since returned to COA to finish out her senior year, and now is trying to re-acclimate to Maine weather—a recent weekend snorkeling trip reminded her of the differences between the waters of her home campus and Kino Bay. But what has stayed the same across geography is her love for her field, which her experiences in the EcoLeague only strengthened.